This article was originally published on July 1, 2008 and expired on September 1, 2008. It is provided here for archival purposes and may contain dated information. Butterfly gardening is a simple term used to describe the needs of the insect and plants that attract them. One of my favorite butterfly attracting plants is called lantana. Lantana is considered an annual in southern Illinois but a perennial farther south. This is a caution I give at all my talks. Make sure those perennials will survive in Zone 6 or you have an annual. The great thing about lantana is it will survive in full sun. This plant will bloom continually throughout our hot summers. It will grow 4 feet wide and 2-3 feet high. 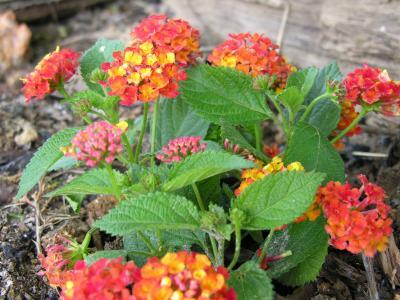 Lantana like all annuals will tolerate pruning to keep the plant confined in its space. Pruning will encourage additional blooming by lightly heading the plant. The flowers will typically change their color as they mature. Flower clusters are a mix of orange, yellow, red or white. My favorite is the orange yellow which is attractive to the eye. Lantana leaves are somewhat poisonous so caution should be observed. Never throw cuttings into a pasture and keep children away from the plant's berries as well. Water new plantings, but once these plants become established in mulch one will only need to water in extreme drought conditions. The newer sterile varieties are best since they produce no berries and will continue with heavy blooms throughout the season. I love their bright multi-colored flowers and their ability to tolerate heat. These plants look great even in August covered with beautiful flowers and an added bonus is butterflies will visit regularly. So if you are looking for a new annual to add to your landscape consider my favorite, lantana. You will not only enjoy its floral display but its decorative floating visitors, butterflies, as well.